I grew up on a farm outside the small northeast Iowa town of Monona. While I lived there, I would think about leaving. The town wasn't "big" enough for me. My dreams demanded that I go some place larger than Monona. But when I think about my life, I feel, very strongly, that small town lifestyle I learned growing up has given me a resilience I might not have gotten had I lived in a large city. It could be argued that it's also the time period in which I grew up; pre-computer; but I think there is just something about a small town lifestyle that teaches you how to roll with the punches. It's less forgiving, to be sure, if something goes wrong. The closest hospital is a 40 minute drive, even in an ambulance. You can't run to the 7-11 at 2 in the morning for a Slurpee and a can of cat food. A trip to the mall involves a full day because that means driving to Dubuque or La Crosse. The small town life also means everyone knows everyone else and I will admit, I don't care for that aspect of it. I am a private person. There are just some things I don't want people knowing. Don't bother pointing out the irony of my having a blog. I can see that, but there are some things that not even the blogosphere needs to know. It is, for instance, no one's business about my comings and goings from my house. As long as I'm not doing anything illegal, why should you care if I am up until 1 a.m. In a small town, that's not the case. I think it is the nature of life in that environment. It's good for kids. Growing up, I knew that if I had a problem, there were places I could go to be safe or to call my parents. I also knew that if I got stopped for speeding, for instance, my parents would know before I got home. One of the local policemen took a very active interest in my youngest brother and other young men in the community. He was concerned they were headed down the wrong path. His death from cancer at the young age of 33 left a void in the community. You could walk to school or the pool or the grocery or the park and know people knew who you were and would keep an eye out for you. Doors were never locked. The Victorian custom of going to visit unannounced on Sunday was still in fashion. In August, it was nothing to come home to two bags of vegetables left on the front step. If your mom got sick with the flu in the winter, there were any number of people who would drop off a casserole or offer to take you "up town" to get groceries. That was just the way it was. Perhaps it still is. My mom is getting older and is slowing down. She's had her knee replaced and I sometimes think about moving back. 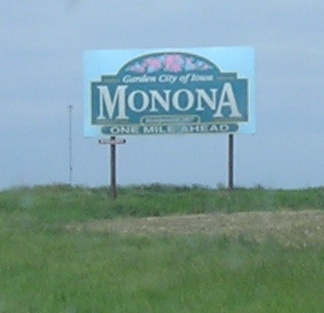 I drove through Monona last week after my business trip. Downtown is a shadow of my memory. The town is still viable and there are new homes on the west side. I thought how the community could certainly benefit from retail development and some other businesses. Big cities have the latest and greatest. They have the captive audience to fund the businesses and services people seem to demand. But I think there's an intangible that we miss when our focus is solely on cities of 50,000 or more. There's a quality of life in small town American you cannot get anywhere else. I would hate to see it fade.